Vapesoul Vone kit comes in dual-18650 batteries which boost a maximum 230w output while the 2ml tank features a top-filling method for easier using experience. The Vapesoul Vone kit is a super compact dual-18650 batteries mod. Like many others, the dual 18650 batteries support a hyper 230w output satisfying most vaping needs. The small mod body is loaded with a 1.3 inch large LCD screen to navigate the user the whole operation. Differing from others, the Vone kit has a big fire button to press with, very comfortable and ergonomic. Moreover, Vapesoul equipped a Bluetooth module on Vone which prevents from a loss. • We provide compatible MOD/tank and coils. Only con shipping was not fast. But that's ok since its free shipping. I'm so excited to get my first TC kit here and its indeed with good quality and easy to use, and I would definitely buy more here! This Vapesoul kit is pretty cool. I love it with bluetooth function, very simple to use! 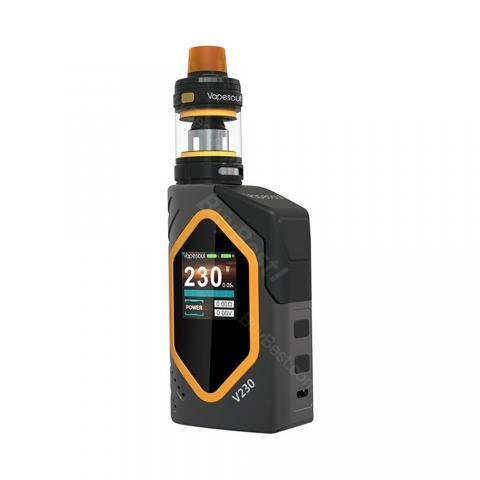 This Vapesoul vone kit from buybest is working great. It has been my favorite daily vape gear since I got it. Nice flavor and vape production. 2ml tank is fine with me too. Vapesoul vone kit is more than what I expected. Working great! I'm happy with the quality, flavor and vapor production. Overall I love this vapesoul vone kit.